Windows 8.1 officially landed last Thursday, bringing a scad of new features and much-needed interface improvements to Microsoft's Live Tiled vision of the future—at least if you were able to get it. While the update's going down without a hitch for the vast majority of people, many would-be upgraders are running into errors that are slamming the brakes on their Windows 8.1 aspirations. Windows 8.1 installed properly on 1 of 3 systems. Maybe I should have stuck with 7. 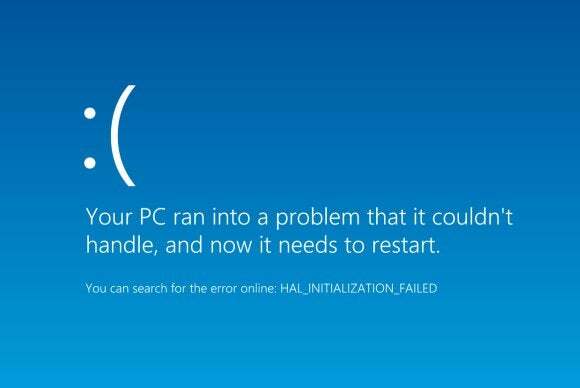 Here are some of the most common show-stopping errors that people have run into over Windows 8.1's launch weekend. Some have fixes. Some do not. "The Boot Configuration Data file is missing some required information"
As I said, most installations of Windows RT 8.1—the version of the update available for Windows RT tablets running mobile-focused ARM processors—have been going smoothly. But when things go bad, they go really bad. So bad, in fact, that Microsoft yanked the Windows RT 8.1 update completely due to "a situation affecting a limited number of users." "Based on our investigations of a situation customers have encountered updating to Windows RT 8.1, we can confirm that as of now this is a Windows update issue only affecting Surface RT customers. While only less than 1 out of every 1,000 ( or less than 0.1%) Surface RT customers who have installed Windows RT 8.1 have been impacted, improving their experience and ensuring their systems are fully operable as quickly as possible is our number one priority." Judging from the 25 page thread in the Microsoft community forum and complaints I've heard on Twitter, this error—or its cousin, which has the same end result but a slightly different numerical code, 0xC1900101 - 0x20017—is one of the more common snafus out there. It prevents users from upgrading to Windows 8.1, but it does roll their system back to Windows 8, so at least systems aren't being bricked. Glancing through the Microsoft thread, the problem seems largely limited to DIY builds or higher-end laptops with discrete graphics cards. A Microsoft representative suggested disconnecting external peripherals and updating drivers then trying again, but the fix doesn't appear to work for most users. Speculation arose that the issue is related to Nvidia's graphics drivers. Indeed, some people managed to blow past the error after updating their Nvidia driver—but not all, and the error's also cropping up in rigs with AMD graphics. While I'd recommend ensuring your graphics driver is up to date with the latest Windows 8.1-supported version if you run into 0xC1900101 - 0x40017, as of now this particular bug remains unsquashed. This particular error has cropped up multiple times on the Microsoft community forum and Twitter, and really, the name says it all. If you're running a solid-state cache drive in sync with a traditional hard drive, it's frequently recommended to move your data files over to the HDD to avoid both filling up and shortening the life of the space-limited SSD. You cannot perform edition upgrades. For example, if you use Windows 7 Home Premium with ProfilesDirectory set to D:\, you will not be able to upgrade to Windows 7 Ultimate or to Windows 8. You could try moving your user folder back to the primary system hard drive, then attempting to upgrade again. That doesn't sit well with many irate users, however, including a Microsoft MVP. Several users have encountered this error while attempting to download Windows 8.1 update from the Windows Store. When the download hits 50 percent, it stops and tosses up this error. There's no known fix for error code 0x80240031, though a very small handful of users were able to eradicate it by downloading all available Windows Updates for their machine, from both the Settings charm as well as the desktop control panel. After successfully upgrading, some users are finding the following message watermarked in the corner of their desktop: "Secure Boot isn't configured correctly. Build 9600." @pcworld @BradChacos My laptop says secure boot configure error. Softpedia reports that the official fix is exactly what you'd think it would be: You need to properly configure Windows 8.1's Secure Boot functionality. To do that, you'll need to dive into your PC's BIOS settings at startup and enable or configure its Secure Boot option. The exact method varies depending on your machine. Check for a Secure Boot option in the Security settings once you're in BIOS. Beyond those major upgrade problems lies a vast universe of little niggling problems caused by the diverse nature of PC hardware. Driver support from individual manufacturers can be a bit hit-or-miss. Hugo-award winning author John Scalzi was but one of many people to run into the following error with Dell's XPS 12 hybrid. Fortunately, updating Dell's drivers fixed the issue. If you have a Dell XPS 12, don't download Win 8.1 yet. It breaks the touchpad functionality. Oh, and if you've got a SteelSeries brand peripheral, you'll need to either ditch it or skip Windows 8.1 completely, as the SteelSeries Engine is being widely reported as incompatible with the update. And by "incompatible," I mean "prevents it from booting whatsoever," which is a major disappoint since the issue has been known since the early days of the Windows 8.1 Preview. So what's the takeaway from all this? 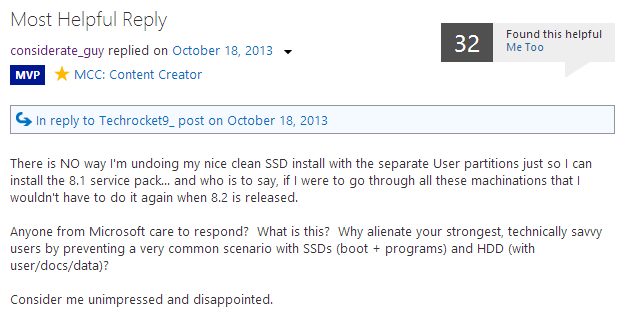 One: Back up your data before you attempt to upgrade to Windows 8.1. (Do we really still have to say this out loud?) Two: If you run into any issues, ensure your drivers are up to date. Three: Early adoption has its risks, even with something as thoroughly tested as Windows 8.1. And once you do manage to snag the update, check out PCWorld's guide to Windows 8.1's best new features to get a taste of all the revamped operating system has to offer.